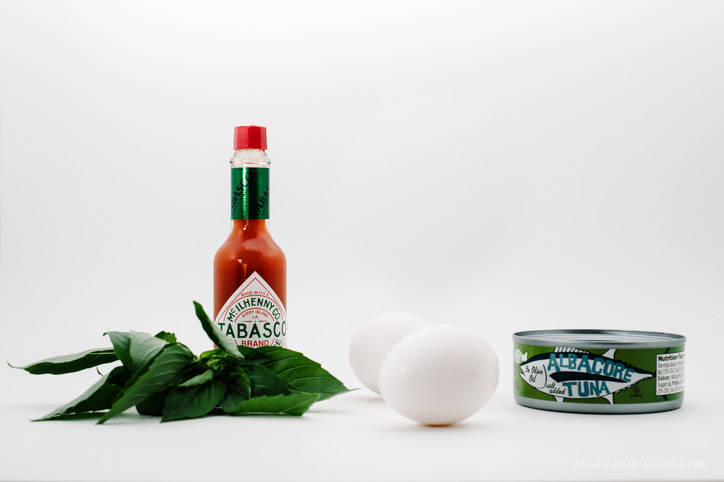 This week I’m partnering up with Tabasco for a 10 ingredient challenge! Essentially, it’s 10 ingredients, 5 recipes. I absolutely love creating dishes when I have a limited number of ingredients. It’s one of my favourite games: what deliciousness can I make out of what’s in the pantry/fridge!? As much as I love grocery shopping, I loathe going out for specific ingredients, so I always pretend I’m in the Iron Chef Kitchen Stadium. Some of my best dishes have been created from using limited ingredients, so I was especially excited when I found out what the ingredient list was. The ten ingredients were: Tabasco, swordfish/tuna, brioche, eggs, mint/basil/cilantro, dark chocolate, eggplant, cherry tomatoes, cider vinegar and maple syrup. Salt, pepper, oil and sugar were freebies. I’ll let you know right now that I cut the ingredient list down to 8 – I didn’t have any cider vinegar or maple syrup lying around so I just pretended it was an 8 ingredient challenge. Eggs always make me think of deviling and ever since visiting Spain last year, I’ve been obsessed with eggs and tuna. I had some eggs stuffed with tuna at a tiny pintxos place in San Sebastian and these little guys reminded me of the hot summer nights, the endless beaches and the beauty of Spain. 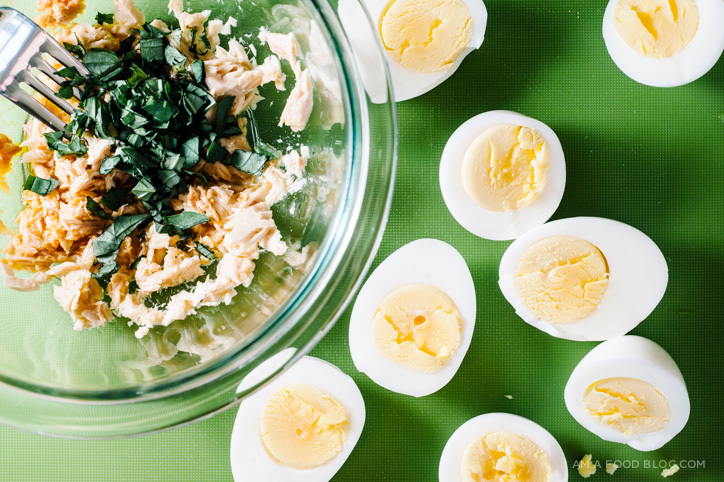 Remove the yolks from the egg halves into a small bowl. Mash the yolks with a fork until fine and crumbly. Mix with the tuna, oil, tabasco and basil. Taste and season with salt and pepper, adjusting tabasco as needed. 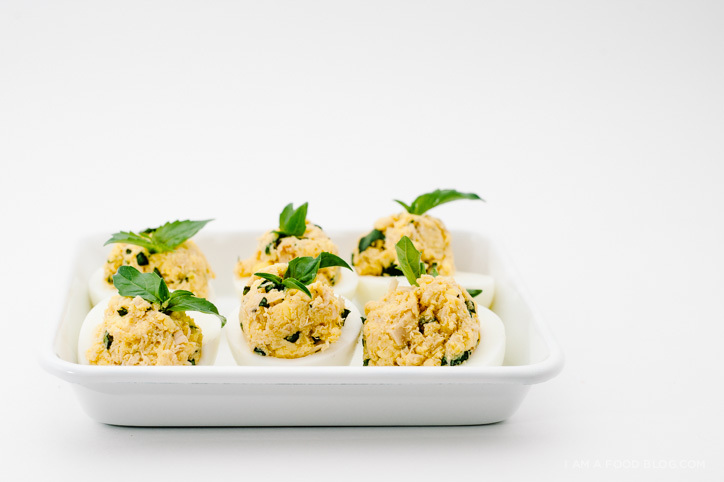 Fill the egg halves with the yolk mixture and top with basil leaves. Enjoy immediately. This post was sponsored by Tabasco! 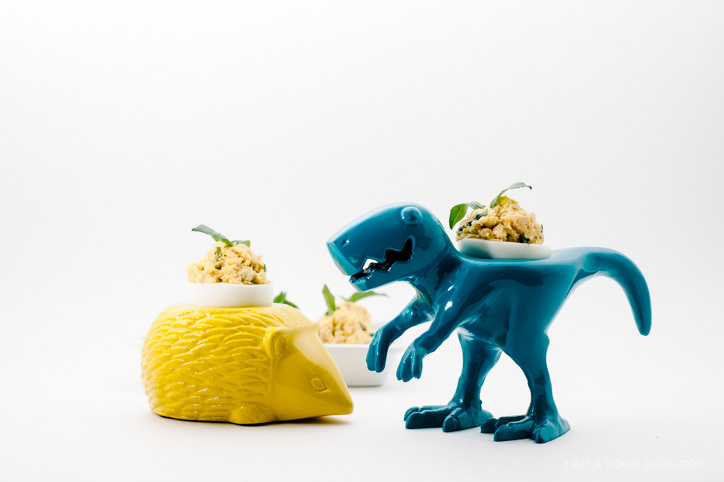 Where in the universe did you find the adorable T-Rex and hedgehog egg cups? I need these…for reasons…. 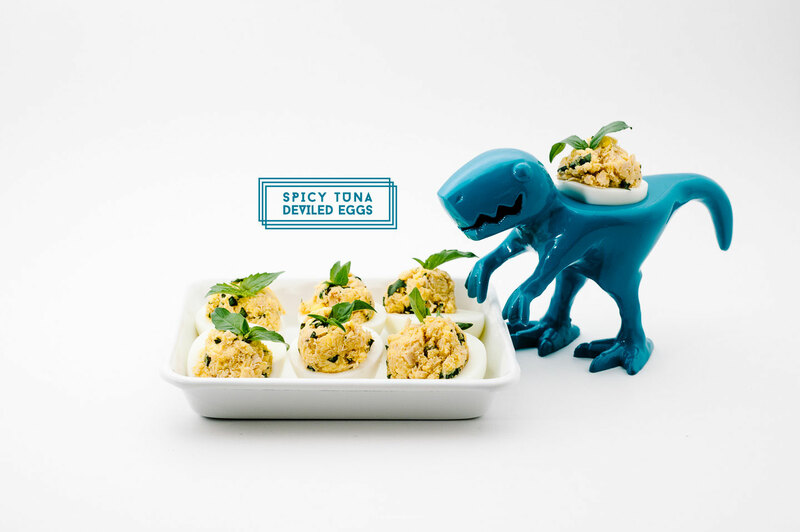 Oh my goodness, putting the tuna in is a cool idea for the deviled eggs. I’m doing the challenge also, and will be sure to visit you every day to see what else you come up with. Love this one. 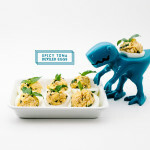 Is that T-rex an egg holder T-rex??? What is that for and WHERE DID YOU GET IT? Loveeee. Hahahahhahahahahhaaaa omg those props are HILAAARIOUS!! You kick originality to a new level mah friend. Tuna and eggs- whats not to love!